Hurricane Sandy may have stopped Google's Android event, but it couldn't stop the Google website. There will be no swanky event in downtown New York City, but Google's Android team has taken to a blog post to announce the latest Android devices, including the long-rumored Nexus 4 phone made by LG and Nexus 10 tablet made by Samsung. Google is also refreshing its 7-inch Nexus 7 tablet, bringing the total number of Nexus devices on the market to three. Nexus devices, unlike all the other hundreds of Android phone and tablets out there, are built in close partnership between Google and other phone or tablet makers. They are also the first devices to run the new version of Android. In this case, all the devices being announced today run Android 4.2, the next version of Jelly Bean. Android 4.2 isn't a complete overhaul of the software, but adds such features as a new keyboard, wireless video streaming services, a 360-degree photo feature, and a new Google Now service. "People increasingly have more than one device, and they switch between them many times a day. Nexus — Google's hardware line for Android devices — gets rid of the hassle," Google's Senior Vice President of Android, Andy Rubin, said in the post. "Just sign in with your Google Account and everything is there ready to go, whatever device you're using: photos, emails, contacts, bookmarks, even your entertainment on Google Play." The new Nexus 4 phone, which is made by LG, will replace the Samsung Galaxy Nexus phone that came out about a year ago. The phone has a large 4.7-inch screen with a high-resolution 1280 x 768 display, and a fast quad-core S4 Pro processor. The camera on the phone has also been updated (it was one of the major pain points of the last version) -- it now has an 8-megapixel camera on the back and a 1.3-megapixel camera on the front for video chatting. The $299 base version has 8GB of storage and a $349 version will have 16GB of space. For now, Google will only offer the phone unlocked through T-Mobile, meaning it won't be available through Verizon, Sprint or AT&T. That also means it will not have LTE service in the U.S. The new Android 4.2 software brings new gesture typing, "which lets you glide your finger over the letters you want to type on the keyboard," Google says. It also supports wireless video and new photo features. The phone will be available to order through Google's Play store starting today and in select T-Mobile retail stores and online on Nov. 14. Moving up to the 7-inch screen, Google has slightly refreshed its Nexus 7 tablet, which it announced back in June in collaboration with Asus. The new version will run Android 4.2, but there is also a 32GB version now that will cost $249. There will be a 32GB version with HSPA+ cellular connectivity for $299. That version will work with AT&T SIM cards and service. The 16GB version with WiFi only costs $199. Apple's iPad Mini, which has a larger 7.9-inch screen, goes on sale this Friday for $329, while Amazon's Kindle Fire HD, which has 16GB of storage, starts at $199. Of course, there's one more! The Nexus 10, as you might guess, has a 10-inch screen and the latest Android 4.2 software. Built by Samsung, the tablet has a high-resolution 2560 x 1600 resolution screen, similar to the Retina display on the new iPad. Internally, the tablet has a dual-core processor and 2GB of RAM. The 16GB version will start at $399. 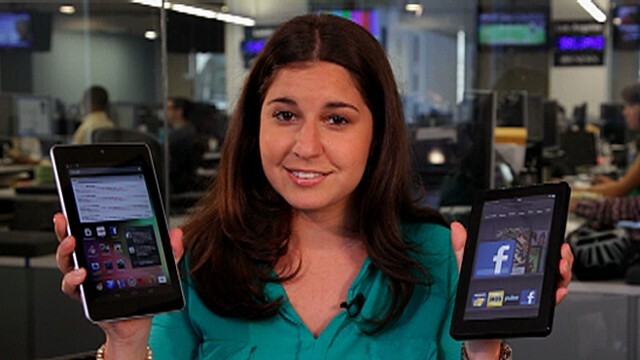 ABC News has been promised a hands-on look at the new devices. Stay tuned for more information.